We are a small breeding farm focusing on the family. We have raised a variety of animals most of our life based on our interests and our children's interests. We always select top of the line stock from top show breeders from across the nation. We have specialized in raising high quality Tennessee Walkers since 1996. We are now focused on raising proven quality Nigerian Dwarf goats, rare and heritage poultry, Ancaona ducks and Royal Palm Turkeys. We raise excellent quality New Zealand rabbits for 4-H and a healthy meat alternative. If you are looking for quality stock for 4-H, showing, breeding program and homesteading you have found a quality breeder to make your next purchase. Information about our stock will be listed under each tab you click on. Take a look around and check us out! The Hester's are developing a learning center for families, field trips and home school students. We will discuss the different breeds of animals that we have as we tour around the farm. 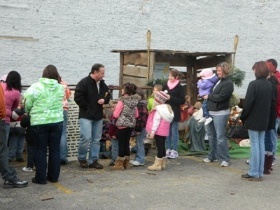 We will have creative learning experiences and games to get everyone involved. Fees will be listed on our Service Page as we get set up. The Hester's welcome you to come and visit our wonderful herd. We are conveniently located mid way between Dayton and Cincinnati Ohio with easy access off I-71, I-75, and I-275. We love and enjoy our miniature donkeys! Our miniature donkeys are of top quality with selective purchases made from top breeding and show farms. They represent the quality desired in the miniature donkey and are all registered with ADMS. Most of all they are all sweet, loving, and sociable with everyone! We are blessed to own beautiful and gentle donkeys. 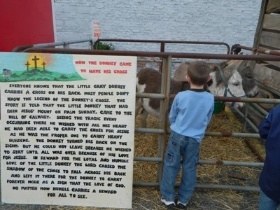 We have the pleasure to display them along with our hand painted sign about "How The Donkey Came To Have Its Cross". We have displayed them in programs to reach out to others through our church. 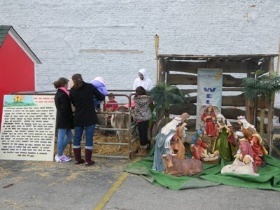 We display them each year next to our church's nativity scene. 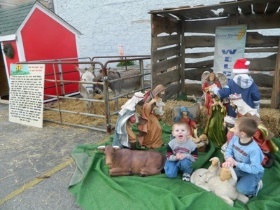 The pictures shown above are from Christmas in Blanchester 2011. Everyone enjoys stopping by to visit our donkeys and read our sign. We just love our miniature donkeys and invite you to join us in the wonderful world of long ears. We will have some available for sale from time to time. Check back often to see if we have your next loving companion for life.